Lead singer Fred Durst has suffered an increasingly painful and distressing back injury. After consultation with a number of doctors and orthopedic specialists over the past 10 days, Durst was told that a ‘mandatory’ rest period of at least two weeks was needed from all physical activities to allow the injury, identified by MRI as a ‘stress fracture to the fifth lumbar vertebra’ to begin to heal. He will then undergo a period of gradual recovery and physical rehabilitation. 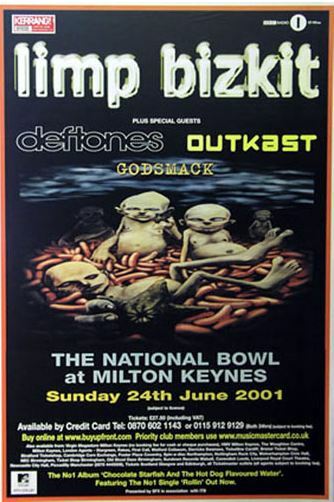 – This show would have been the biggest headline show for the band, with 65000 tickets sold, making this show sold out. 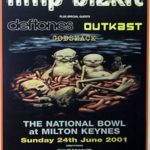 – Deftones and Outkast were supposed to be support for the band along with Godsmack, who opened at all European headline shows in 2001.